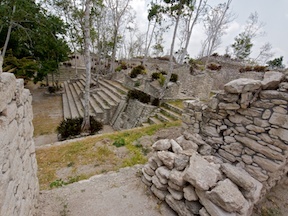 Dzibanché, Lamay, and Kinichná are a trio of Classic era sites within a few minutes drive of each other, all about an hour’s drive west of Chetumal or Costa Maya. One ticket will get you in to both Dzibanché and Kinichná (Lamay is free, but with limited access), and the sites are not well-known, so you may well have them to yourself. Most of the structures here are climbable as well, as opposed to the case at more heavily-visited big name sites — so you can get some great views. A Photographer’s Guide to Dzibanché, Lamay, and Kinichná is a comprehensive guide to the ruins, with an eye toward making the photographs you take there the very best they can be. Containing 4 maps, 19 images, and 19 pages of site-specific material (if printed on letter sized paper), this guide costs $2.99. Once you purchase the eBook, write down your password (from Appendix C of the eBook), and head over to the Dzibanché / Lamay / Kinichná supplemental page for downloadable extras. Buy the eBook for Kindle at Amazon.com (US store, UK store, DE store, FR store), for Apple devices on iTunes / iBooks, for the Nook at Barnes & Noble, and for all other devices at Smashwords.